This weeks Bloggers Challenge theme is Birds, what you do with birds, or how you interpret the theme is totally up to you. We have a lot of birds in our yard this year, I enjoy watching them as I'm working. I have quite a few wonderful Bird images, but decided to go a different route and used the Bird Cage Die along with some wonderful Websters Pages paper. Yes, my art is all over the place these days.....But I'm enjoying it! 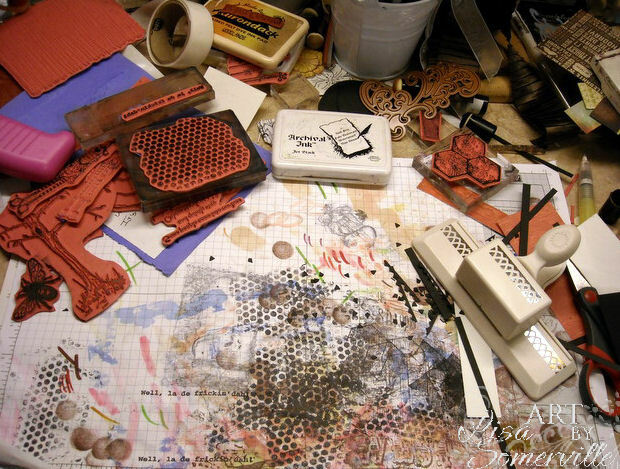 All stamps are from Tim Holtz, as are the Dies. The bird cage was cut from a piece of Sparkle paper, then placed on dimensionals and added to the pattern paper. You wouldn't know by looking at this sheet, put it's actually the cover sheet that comes with the pack of paper, I just couldn't let it go to waste, so I covered up the "logo" part with my sentiment panel. I added some Seam Binding that I dyed with Spun Sugar Distress Stain. Love this stain for dying ribbon! I need to find a "seam binding 101 bow tying class", as I still fumble to make pretty loopy bows. I know I could use my Bow Maker, but those aren't the types of bows I was looking to make. I added some twigs, a stamped ticket and Tattered Floral cut from Vanilla corrugated paper to finish off my card. No foolin'! Here's what my desk looked like before I started to work on my card. I always chuckle when I see other bloggers WOYWW pictures and their desks are all neat an clean. Not mine...after a busy week, mine usually looks like this by Thursday - with about an 8" x 8" workable area. Anyone want to come and clean create with me! When you're done laughing as my creative mess, grab your stamps and play along with this weeks challenge, I'd love to see what you create! If you'd like to play along with this weeks Bloggers Challenge, please link back to this post on your blog and mention you created your card for the Bloggers Challenge Bird Themed Challenge. Please add your link using the Link Tool below. Just a note on the link tool, your link should be a direct link to your Bloggers Challenge Post, use your name as the Title. Please do not link to cards that were created prior to the challenge date. Entries not linking properly will be removed. The final photo is the best lmao I'll have all day! I feel right at home and I'd luv to come and play with you! Your card is positively FAB GF, I luv all your elements, great balance and color and using that top sheet rocks! Ohh Lisa - that is like looking in my office! ROFL! They say Great minds think alike, hey? Beautiful card - Love the pinks and browns. I have that bird cage too and often wonder what to do with it. Thanks for the inspiration! Your so funny, my entire studio looks like that at the end of the week and I have over 40 foot of workable area--it ends up being about 10" by 10" but the end of the week, couldn't even work on a scrapbook page the other day--had to use the floor! Crazy, love to see others are the same way. I love your card for this week, I also love the challenge this week! You have been all over the place lately but you are rocking all the styles. Lisa, your cards are always awesome, but recently they are getting even AWESOMER. Fantastic card. Your workspace looks normal to me. LOVE your work station! looks like mine! I am really TRYING to get it together... :( Awesome card and the "couple" below is hilarious..really really cute! I thought I knew you and then you take that lovely picture of a messy desk! WooHoo, I expected your desk to be anything but messy! Love it!!! Do you notice how little I do bows?? At least I can tie my shoes! Beatiful card, Lisa! Love the birdcage and the lovely papers! Love your card and the use of the Birdcage Die - Very Shabby Chic feel. Oh yeah, that's my work desk too. Well that's what mine looks like most of the time. I occasionally clean it off but it doesn't stay that way long. Beautiful card, love the seam binding color and I need that bow class too-that sentiment is perfectly stated! she has a great tutorial on seam binding bows. Great card, Lisa. Love the touch of the "admit one" ticket. Cute. I love all of the elements that you included to go with the theme! I also like the look of your craft room! I'm glad I'm not the only one to bury myself! Beautiful card--love the sentiment and you are very creative using the cover from the paper pack! Love this card!! So many fun embellishments that tie it all together fabulously!! Awesome job! I love HOW you work. My desk is rarely clean - only for photos! Awesome card love the colors you used the papers are fantastic and the birdcage is just gorgeous. Thanks for sharing your work space..I keep saying I'm not going let mine get cluttered but just one card project and like you I have a very tiny work space! Oh my gosh! I love it Lisa! Very pretty card :) Love your bird cage. Your card is magical. Great desk shots..looking how a desk should look! Beautiful card, love that sentiment, and the vintage look is stunning. Funny how our desks can look unorganized to everyone yet we can find absolutely everything in a jiffy. But I must admit, I can lose something without getting out of my chair when I am tired! Awesome work. Love the card. The birds nest is really clever. love all the texture. I also love your workspace. My space looks like that WAYYY too often. Lovely card and the cage is fabulous with the silvery effect. Love that sentiment as it really applies to me. :) Love the picture of your desk. Doesn't everyone's look like that while creating? HA! LOVE your interpretation of this week's Challenge...and I especially LOVE that saying!! Great card, as always....the bird cage is a great idea. How clever of you to use the coversheet! 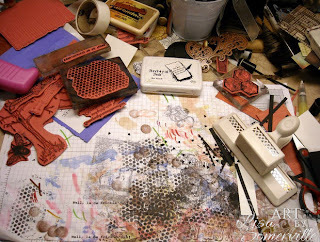 As for your stamp space...guess we're all kind of alike in that regard....the mess seems to grow on its own until we can't stand it any longer!! Just beautiful, Lisa! I really like the look of the sparkly bird cage. 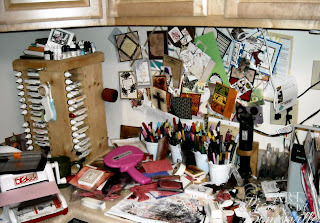 And, I'm glad to see that someone else's work space looks a lot like mine--LOL! 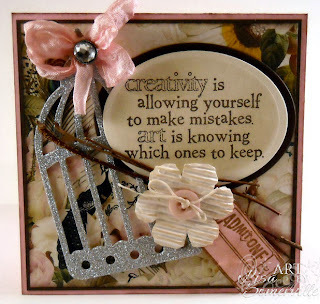 Very pretty-I really like the bird cage die cut and the pink ticket. Nice contrast of delicate and chunky. Beautiful card. I love all the separate elements of this card and how they all work together -- tons of texture and that is what I'm all about. And it really is funny how often my space looks just like your space -- why are we always willing to work ourselves into a hole and then keep on going?